So I got creative. After getting a batch of potatoes bathed in olive oil, lemon juice, garlic and Greek spices in to the oven to roast, I halved the tomatoes and scooped out the watery seeds, just leaving the juicy yet still firm flesh behind. Kosher salt served both to season the insides of the tomatoes and encourage them to let down some of that juice once I turned them upside down on top of some folded paper towels. I oiled the pan and the tomatoes with more olive oil and spaced the red beauties out, cut sides up, and stuck them in with the potatoes to roast for, oh, about 15 or 20 minutes at 375-400 degrees (you see, I’ve already forgotten), until they had softened and sizzled and the kitchen was perfumed with their scent. I used a bamboo skewer to pour the juices that had gathered in the bottom of each tomato half as it had baked. While they’d been in the oven, I’d mixed up some falafel and set it aside to absorb the water I’d added. I rolled the falafel into tiny balls, much smaller than I expected, and pressed it into each tomato. I think I also sprayed them with a bit more oil at that point, in the hope of simulating frying the falafel in a pan. Then I baked them again, this time at only 350 degrees but with the convection fan on in the hope of giving the falafel a golden, crisp top. Chris walked in the door around that time, perfect timing for the falafel to come out and join the potatoes, a simple salad of cucumber, tomato and red onion and toasted whole wheat pita wedges I’d resurrected from the depths of our freezer. I topped each tomato with a bullseye of yogurt sauce, my quick-and-shameless substitute for tzatziki sauce that I make when I don’t have the forethought to make the real thing, that needs only plain yogurt, lemon juice, olive oil, salt, dried dill and a few minutes to sit mixed up on the counter to meld the flavors and hydrate the dill. The tomatoes were delicious, even better than I expected. Roasting had only made them sweeter, and they balanced the salty, seasoned falafel wonderfully. Not only that but they were beautiful on the plate and fun to eat, a little bite-sized taste of savory sunshine. I even got some halfway decent photos of my plate even though I was too impatient to eat to take very many, leaving me with a quick and easy post whenever I wanted to write it up. The problem was that they weren’t perfect. There was a little too much falafel-to-tomato, so that the middle of each was a bit mushy, a bit much in general, and the falafel mix I used seemed especially bitter to me. Whether that was from aging in our pantry or just a flavor that’s always there that the roasted tomatoes brought out, I don’t know, but I kept wishing it wasn’t there. The tomatoes should have been the best thing on the plate–they certainly had all the potential necessary for that–but the roasted potatoes won that honor instead. Of course, they were possibly the best potatoes I’d ever roasted, but the tomatoes could have topped them all the same. I decided that I needed to make the tomatoes again, to give them a chance to shine in all their glory. I’d make falafel from scratch, despite a superb failure at it early in my cooking career that discouraged both of us not to try to make it ourselves again. I’d look into hiding a little surprise of flavor under the falafel. My first thought was feta, but the powers that be warn pregnant women away from soft and blue cheeses, so I talked to the nice people at the cheese counter at Whole Foods and struck upon mizithra cheese as a substitute, maybe with some chopped kalamata olives to really punch up the flavor. I even thought about making my own pita. We did that in pastry school, and it was actually pretty fun and easy. Maybe this time I’d roast the tomatoes low and slow in the oven overnight to dry them out better and super-concentrate the flavor, and maybe I’d try flipping them over and frying them at the end once the falafel was cooked through down to the cheese and olives. And with all of that effort, surely the tomatoes would be worthy of words at the end. I bought all the ingredients, and even blended up my falafel, but somehow the tomatoes still haven’t graced our table again. Why? I’ve utterly lost an interest in eating them. It seems the gustatory life of the pregnant woman is far more complex than the morning sickness or pickles and ice cream jokes would lead you to believe. I have yet to actually crave anything. To me, a “craving” implies an intense, physical desire for something. What happens to me is something quieter. I think of a food I’d like to eat, and it sounds like a really good idea. I won’t crave it, but I also never forget that good idea until I’ve carried it out. My body will wait two patient weeks to get a chocolate doughnut, and once I’ve had that doughnut, the idea will quietly leave me in piece. The good idea may lead me to coerce friends into going to a particular restaurant to get the particular pizza I thought about two days ago, but I’ll never sit there agonizing about having to have that pizza right this instant. As far as I can see, Chris gets the most benefit out of this since he has yet been called to duty in the middle of the night to go out and get me ice cream. Apparently, my body now has this same power in reverse. The tomatoes sound like a wonderful idea to me intellectually, something I’d like to do and photograph and write about, but my body just yawns in response to the idea of them and sends me off to make scrambled eggs for a breakfast burrito. But if anything, pregnancy is teaching me that my body is wise. It knows what it wants and what it needs, and tomatoes stuffed with falafel is not currently on its list. It doesn’t care about satisfying my ego, only satisfying itself and the little life growing inside of it. You don’t need to make those tomatoes again, it says. Didn’t you already make them? Don’t you already have pictures? Isn’t the whole point of writing about them to pass on the idea, and haven’t you already proved it was a good one? Now, weren’t we thinking about making oatmeal for breakfast? it adds, and leads me into the kitchen to do its bidding. 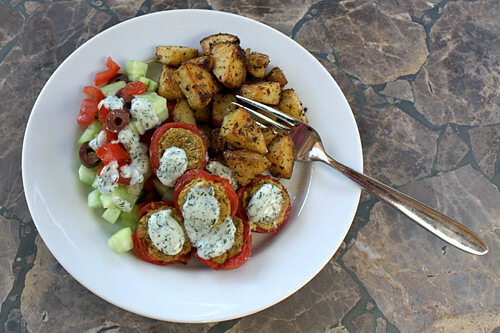 And so I give you my Falafel-Stuffed Roasted Tomatoes idea, and hope you’ll take it and improve on it and tell me how it went, so that when my body lets me make them again, I’ll know how to make them better. Your body knows best, I guess, though it still seems a little sad for the interest in certain foods to fade away. Truly there are greater forces at work and if your tiger cub is demanding breakfast burritos and not your falafel filled tomatoes, then so be it, I guess. I have to tell myself that my body knows best, because otherwise the apathy is a bit depressing! At least it’s better than it was. For about a month, all I wanted to eat was fresh fruit…which is healthy in a way but doesn’t help me with things like protein, etc. 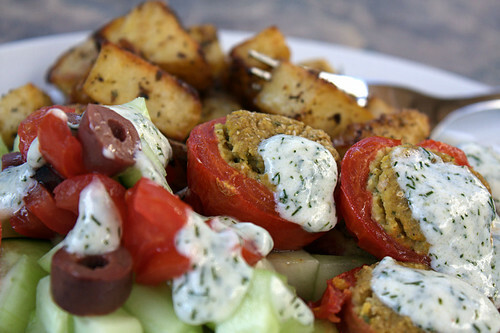 Falafel stuffed roasted tomatoes sound good! Thanks! They were pretty good! I stumbled upon this site while searching for “stuffed falafel.” Seems you had the reverse idea! It looks great. That first photo is very enticing. I also really enjoyed your writing style, and have bookmarked your site to read through later. Good luck with the pregnancy!